Supervisor Tips: Toxic Staff, Toxic Workplace - I Love ABA! You may have heard before that "Bad company corrupts good character" (1 Corinthians 15:33). From experience, I can definitely attest to this. How I usually refer to this is "crap rolls downhill". Just like 1 bad apple in a basket can taint the other fruit, 1 toxic employee can lead to stressed out supervisors, lazy staff, dissatisfied clients, and overall decreased productivity. Toxic staff end up zapping away at the energy, enthusiasm, and productivity of management, because they have to be given instructions repeatedly before they comply. They respond to change or new ideas with skepticism and criticism, so time must be taken to get them on board. They complete assignments late, or submit them on time but incomplete, so the supervisor has to take time to meet with them to go over their assignment in detail. 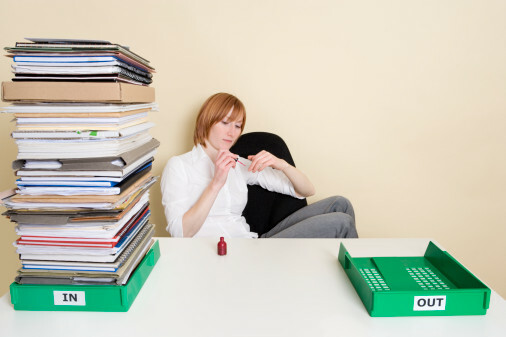 A busy supervisor just doesn't have the time or mental energy to devote to a toxic employee. Trust me when I say: its draining. That's just how this impacts management. Toxic employees also impact their colleagues. Even when placed in a group of energetic and dynamic staff, a toxic employee will cause others to begin to speak negatively, gossip at work, become less and less productive, and grow distrustful of management. The negative attitude of toxic staff can be quite contagious. So what can be done about this? Firstly, what policies and procedures have you and your employer put in place to ensure the workplace remains non-toxic? How is insubordination from staff handled? If staff are rude or harsh towards clients, how is that handled? Does the hiring and interview process take into account personality, attitude, and fit into the company culture? Do you make it clear to staff that energy and positivity are a part of their job? Do you communicate the need for staff to be patient and compassionate with the clients, especially when they feel the least like doing so? Do you regularly give detailed feedback (including constructive criticism) to staff, to help train them on how to respond to feedback? Are YOU providing a good model of emotional regulation? If an employee angers or frustrates you, do you handle this in a professional manner? To my fellow BCBA's dealing with toxic staff, here are a few suggestions that may be helpful. If nothing proves to be effective, then just as I have talked about with poor quality ABA providers, or persistently uninvolved families, termination may be the best option. The very first thing you need to do is confront the individual about their behavior. It really is true that sometimes super disrespectful and apathetic staff are not aware their behavior is a problem. Using calm and respectful language, openly discuss with the employee exactly what the problems are, and be prepared to give specific examples. This should be a calm conversation, not an argument. Explain to the employee why their behavior is unacceptable. Help them to connect the dots between what they are doing, and how it negatively impacts other staff, clients, and the supervisor/management. For example: "You regularly fail to meet my deadlines, and often submit work 2-5 days late. When this happens, I have to rearrange my supervision schedule and priorities to add more time to review your work so I can give you feedback. This then makes me late getting my own work done, and is also stressful". Create an action plan. Together with the employee, devise a plan for correcting their behavior. This may include some skill acquisition, for example the employee may not know how to properly respond to feedback they don't like/agree with. Determine how progress will be measured, who will conduct the evaluation of mastery (I suggest both of you), and what will happen if satisfactory progress is not made. Lastly, consider disciplinary actions. Perhaps a written reprimand, a demotion, or a reduction in salary until specific performance criteria has been achieved. Particularly since a toxic employee is likely to shift blame, I recommend some type of self-management or evaluation. Have the employee critique their own performance such as viewing video of their sessions with a client, or collecting data on how often they arrive late to a clients home. Its pretty hard to point fingers at everyone else when looking at raw, objective data. Thank you for this!! Currently dealing with some issues similar to this. It's refreshing to know it is not just a problem I have to deal with.You have some awesome ideas. Love your blog! Trust me, you are not alone. I have, unfortunately, had to work with toxic staff as the management over me wouldn't do anything about the employee. So I had to figure out on my own, how to minimize the negative impact of the toxic staff. Glad the ideas were helpful to you!